Category: Books, Children's and Parenting, Self Help & Personal Development Tags: arts and craft, children, forest school, habitat management, Illustrated, nature, outdoor play, parents, woodcarving. Help your child connect with nature, be adventurous and most of all have fun, with these woodland games, crafts and skill-building activities from Forest School. The ultimate guide to woodland fun with kids! Forest School is founded on a philosophy of nature-based play and learning that encourages children to develop confidence and self-esteem. This book will get your kids outside, making and building in the real world (instead of on a computer screen!). Whether your local woodland is a forest or a strip of trees along the edge of an urban park, these activities provide fantastic opportunities for family time and will encourage your children to fall in love with outdoor play. 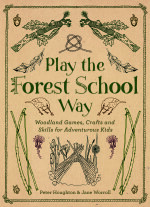 This is the first book to share Forest School games, crafts and skill-building activities with families and friends, its magical illustrations and simple instructions drawing children easily into a world of wonder. Be a fox tracking its prey, a moth evading a bat, a rabbit fleeing a forest fire! Make a working bow and arrow, spectacular headdresses, beautiful woodland jewellery, magic wands – all with materials gathered from the forest floor. Learn wilderness survival skills: build a shelter, make fire, forage and cook wild food. Peter Houghton is a qualified Level 3 Forest School leader, running, with Jane Worroll, year-round Forest School sessions for children in London and elsewhere. At a charity supporting vulnerable inner-city children and young people, he worked as an artist (in woodwork and other media) and as a key worker, as well as leading Forest School sessions. He is qualified and experienced in historical and ornamental woodcarving and in green woodwork. Jane Worroll has worked outdoors for the majority of her adult life, in gardening, tree surgery and, for 12 years, as a Countryside Ranger, a role that included habitat management, monitoring protected species and leading volunteers. She has a degree in ecology as well as an MSc in environmental conservation.